Put-in-Bay Ohio is bringing some new and exciting musical talent to the island this summer with the Music Fest. They include bluegrass, new grass, folk, zydeco and rhythm & blues. 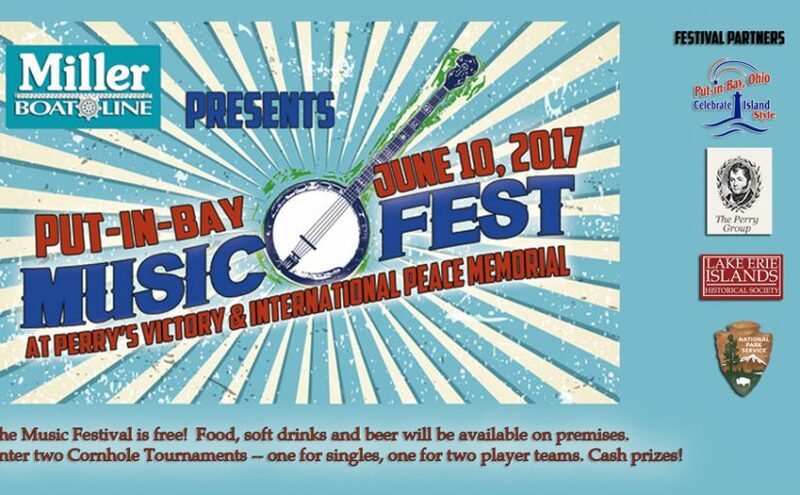 Island visitors will get to experience all this for free this summer as the island kicks off 2017 with the first Put-in-Bay Music Festival on Saturday, June 10, at Perry’s Victory & International Peace Memorial here on South Bass Island. The Put-in-Bay Music Festival kicks off at 11:00 AM with the final musical act wrapping about 8:00 PM. Miller Boat Line is one of the sponsors of this event which is a collaboration between many partners, including the Put-in-Bay Chamber of Commerce, the National Park Service, the Perry Group (Perry’s Victory’s Friends Group), and the Lake Erie Islands Historical Society. Information about Put-in-Bay, including lodging, dining and live entertainment can be found at the main Put-in-Bay visitor website, www.putinbay.com. This year’s Put in Bay Music Festival line-up includes such wonderful acts as: Strung Like a Horse, Emily Keener, Mo’Mojo, The Floorwalkers, JP and the Chatfield Boys, The Flyin Jays (an island fave), The Oh Chays and Put-in-Bay Anthem songwriter and singer Bob Gatewood. Each act will perform 45 minutes to an hour or more.